Its been a busy week. If something was going to go wrong it did. So needless to say I didn’t get much sewing done but I made up for it today. This morning I got my girlfriends quit that she purchased finished. 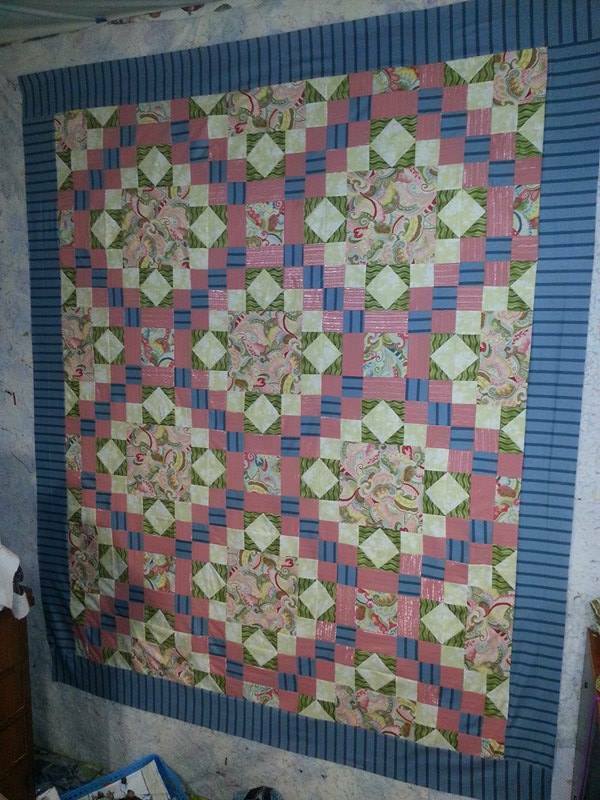 Its called “28 Karats” Only thing, she wanted it enlarged from a double to a queen quilt even though it was already bound. so I added extra 10″ borders to the sides of the quilt. I actually was able to reuse the binding. The after noon I worked on the 2016 Christmas sew along that I am hosing starting on this Wednesday October 26. I had so much fun with this one that I’m going to make an other using Christmas fabrics and also so that I can sew along with everyone participating. These are my christmas fabrics chosen. Now I’m working on finishing a christmas runner that I made with a panel. all that’s left to do is sandwich and quilt and bind. I should have it done by this evening. What have you been working on…..